With Christmas behind us and New Years approaching, today we hosted a tour group from Hyde's Encore Tours and Travel in Salt Lake City. The folks from Hyde's are terrific. It's been a while since we cruised with them, so it was fun to catch-up and enjoy a near-perfect day on the water. 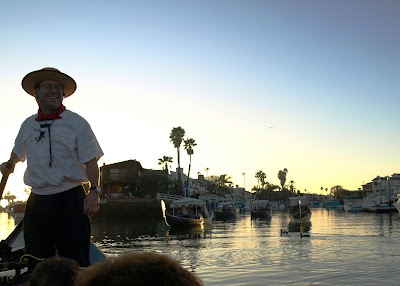 Flotillas are always great fun, both for passengers and gondoliers. We cruise together as a group, trying to stay as close as possible without bumping into each other. The passengers can joke with each other between boats, and the gondoliers take turns singing for the group. The whole experience is more festive and performance-oriented, but it works perfectly for tour groups. Several gondoliers have added new songs to their repertoires after hearing other guys sing them on flotillas. Gondoliers get to see how the other gondoliers carry on with their passengers, and they also get to work on their boat handling skills. We try to keep the crashing to a minimum.